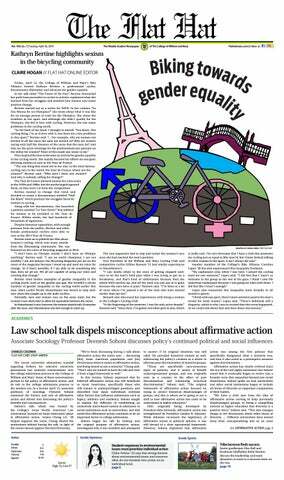 Friday, April 12, the College of William and Mary’s Bike Alliance hosted Kathryn Bertine, a professional cyclist, documentary filmmaker and advocate for gender equality. In her talk titled “The Power of No One,” Bertine chronicled her path from journalist to cyclist to activist, explained what she learned from her struggles and detailed how anyone can create positive change. Bertine started out as a writer for ESPN. In her column “So You Wanna Be An Olympian?” she wrote about what it was like for an average person to train for the Olympics. She chose the triathlon as her sport, and although she didn’t qualify for the Olympics, she fell in love with cycling. However, she saw many problems in the cycling world. “In the back of my head, I thought to myself, ‘You know, this cycling thing, I’m so in love with it, but there are a few problems in this sport,’” Bertine said. “… For example, why are women not invited to all the races the men are invited to? Why are women racing only half the distance of the races that the men do? And why are the prize winnings for the professionals just pennies on the dollar for women? None of this made any sense to me.” This inspired Bertine to become an activist for gender equality in the cycling world. She mainly focused her efforts on one goal: allowing women to race in the Tour de France. “The one thing that stood out to me was: in the most famous cycling race in the world, the Tour de France, where are the women?” Bertine said. “Why aren’t there any women? And why is nobody calling for change?” The Tour de France allowed women for a few years in the 1950s and 1980s, but the media largely ignored them, so they were cut from the competition. Bertine wanted to change that trend and decided to create a documentary entitled “Half the Road,” which portrays the struggles faced by women in cycling. Along with her documentary, she launched a petition entitled “Le Tour Entier” that lobbied for women to be included in the Tour de France. Within weeks, she had hundreds of thousands of signatures. Despite immense opposition, with enough pressure from the public, Bertine and other female professional cyclists were able to race at the 2014 Tour de France. Bertine went on to publish her film about women’s cycling, which won many awards from the filmmaking community. She was featured on the cover of Bicycling magazine in 2016. “I don’t have an Olympic medal; I don’t have an Olympic anything,” Bertine said. “I am no world champion; I am not wealthy; I am not famous, but Bicycling Magazine put me on the cover of the magazine because I stood up and used my voice for change. So if that’s possible, if I am able to do something like that, then we all are. We all are capable of using our voice and creating that change.” Bertine cited further examples of gender inequality in the cycling world, such as the gender pay gap. She recalled a recent incident of gender inequality in the cycling world earlier this year, when cyclist Nicole Hanselmann was forced to stop midrace when she caught up to the male cyclists. Normally, men and women race on the same track, but the women’s race starts later to allow for separation between the racers. In Hanselmann’s race, however, the women started only 10 minutes after the men, and Hanselmann was fast enough to catch up. The recent university admissions scandal regarding bribery for selective university placements has renewed conversations over the college admissions process at the College of William and Mary. Some of these conversations pertain to the policy of affirmative action, and its role in the college admissions process in the modern era. In a lecture April 15, associate professor of sociology Deenesh Sohoni examined the history and role of affirmative action and delved into discussing the policy’s benefits and consequences. Sohoni’s talk, which was hosted by the College’s Asian Pacific American Law Association, focused on Asian Americans’ place in affirmative action. Ariana Cheng J.D. ’20 helped organize the event. Cheng shared the motivations behind having the talk, in light of the recent lawsuit against Harvard University. The best contribution I could make to the world was to share information about what I experienced, what I saw. The world knew about the atomic bomb, but they didn’t know what they did, how they destroyed. — Setsuko Thurlow, a survivor of the 1945 atom bomb dropped by the United States on Hiroshima during World War II. From the perspective of a survivor, Thurlow discussed the topics of peace and advocacy for complete nuclear disarmament. Marksteiner wrote a companion piece to Shakespeare’s “Cymbeline” as her thesis to highlight the storyline of female characters in the male-dominanted play. CORRECTIONS An article in the April 8 issue, “College professors discuss climate change denial in the United States” incorrectly stated that Californians get more proportionate say in the U.S. Senate than Wyomingites. In fact, Wyomingites have more proportionate say in the U.S. Senate, as both states have two senators, but the population of Wyoming is much less. The Flat Hat wishes to correct any fact printed incorrectly. Corrections may be submitted in email to the editor of the section in which the incorrect information was printed. Requests for corrections will be accepted at any time. Marksteiner formed her own theatre company Class Act Players along with Alex Poirier ’19 and Alex Bulova ’19, producing their own original plays. Nocks went on to explain that the Review Board called into question the wisdom of the current election process but did not doubt the constitutionality of the election. “This Review Board is not empowered to fix ignorant, offensive, or ill-advised decisions,” Nocks said in a written statement. “There are other actors for who are and may adjust the system as they see fit. In this case, however, the Review Board rules for the respondent and rejects the petitioner’s claims that the 2019 election process was unconstitutional on account of select voter ineligibility in student body races.” However, the dissenting opinion written by Balaan and Boustany, stated that students were deprived of their right to vote in the campuswide election of Vita and Thomas, and argued that the IEC should not be allowed to determine voting eligibility. “Considering the framers of the SA Constitution were only amateurs, it is extraordinarily dangerous and a tremendous leap to infer Code §5.3-7 means the IEC has been afforded the authority to define voting eligibility as it pleases,” Balaan and Boustany said in a written statement. Blackburn voted nay, Nocks voted nay and Siegmund voted nay while Balaan and Boustany voted yea. The Class of 2020 was not included in the Review Board’s decision as all presidential and senatorial seats were uncontested. “I’m interested in having those clarifications made,” Bowden said. “I’m interested in fighting to make sure that nontraditional students on this campus, no matter what they are — transfer, part-time, medical overload, whatever it is — have a voice in our student government. Our constitution in non-specific clauses says that we shall derive our power form the students at the College of William and Mary in Virginia, and it’s frustrating; I’m graduating, and I’ve honestly only voted in one competitive race.” The next case the Review Board heard was Baker v. Bowden, where Baker asked the Review Board to question the constitutionality of Bowden’s position as a class of 2019 senator due to his full-time underloaded position, which is a condition that violates eligibility for a senate position. Baker did not request that the board terminate Bowden’s current position, but instead asked to clarify when an individual is eligible to run for a senate position in the future. Bowden argued that the Constitution states that an individual is still eligible for a senate position if at the time of running that individual was not aware that they would not remain a regular full-time student. According to Bowden, he did not know until December that he would be changing his status to full-time underloaded but ran for his senatorial position in spring 2018 before that deliberation had been made. The Review Board unanimously decided that Bowden was constitutionally elected due to him not knowing at the time of running that he would be a full-time underloaded student this semester. Editor’s Note: The Flat Hat would like to clarify that Anna Boustany ’21 is an Opinions Editor for the paper. Her involvement with Student Assembly is not on behalf of the paper’s interests. were missing. Skin and flesh hung from their arms. Some carried their eyeballs, and one by one they collapsed to the ground.” Thurlow pointed out that it was not just the people from Hiroshima who were impacted by the atomic bomb. Those who lived in nearby communities fell victim to radiation poisoning when they tried to help survivors from the fallout. The issue was exacerbated by the fact that doctors had not yet become accustomed to treating people with radiation poisoning. As a side effect, women who were pregnant during the blast passed along unintended health effects to their unborn children, whose development would be suddenly halted as a result of the radiation. “Some women produced deformed babies,” Thurlow said. “We were of course under American occupation, so we don’t know exactly how many, but there are many pictures. Many of these babies had the condition known as microcephaly.” During her time under American occupation, Thurlow witnessed the negative treatment that hibakushas suffered under rule from the American military. “General McArthur came to demilitarize and to democratize Japan, but as far as Hiroshima and Nagasaki were concerned, he did the complete opposite,” Thurlow said. “Anything disadvantageous to U.S. forces was forbidden to be published in the papers. They confiscated the diaries and correspondence of survivors. Even haikus and photographs were taken and shipped back to the United States.” Despite the censorship that she experienced as a hibakusha, she felt it was imperative to share her story as one of the few people with firsthand knowledge of nuclear war’s extensive human costs. “The best contribution I could make to the word was to share information about what I experienced, what I saw,” Thurlow said. “The world knew about the atomic bomb, but they didn’t know what they did, how they destroyed. I’m not a physicist, but I do remember what I experienced and that’s something that no human being should ever experience.” After moving to North America in the years following Hiroshima, Thurlow expressed her dismay at encountering Americans and Canadians who felt that the Japanese people deserved to have experienced the detonation of two atom bombs. “In the United States, people were busy justifying the atomic bomb — that the Japanese deserved it — which is extremely painful for me,” Thurlow said. “Even in Canada, that kind of talk was prevalent.” In closing her talk, Thurlow expressed condemnation against former President Truman’s actions, standing firmly in her belief that there is no circumstance whatsoever in which nuclear detonation on civilian populations is acceptable. David Cameron’s decision to hold a referendum on Brexit contributed to pro-Brexit sentiments throughout the United Kingdom. By holding a referendum and legitimizing Brexit as a viable political pathway, voters were led to believe that exiting the EU would not be devastatingly drastic since the government entrusted the decision to public opinion. “I think one of the things David Cameron completely failed to grasp is on a major constitutional issue, if you hold a referendum, you validate both propositions,” Melding said. “So the public, acting rationally, they think, ‘Well, I can see we would have a different future if we stayed in or left, but it can’t be that bad if we leave, because the government wouldn’t give us the option of choosing that if it was so catastrophic.’ And I think the public made a rational judgment on that, but I don’t think that many in the government quite realized that that was what they were doing.” Melding then discussed the future of Brexit, saying that the lack of a cohesive plan is largely due to opposing viewpoints on what Brexit means both politically and economically. Melding himself believes that a new economic vision must be formed to unite EU countries. Students who attended the talk were torn on the implications of Brexit, and some agreed with elements of both arguments. Race Theory to support the findings of their own study. Gender-Race Theory, or Critical Race Theory, emerged in the early 1980s as social scientists began to look at legal studies that pertained to race issues. “When we think about intersection identity, we are drawing on research that draws from the marginalization of more than one social category and what that means,” Gosin said. “We can think of the black feminists, Civil Rights movement and feminist movement overlooking the value of black women and other underrepresented groups.” Back in 2015, the professors had begun to deduce that the results of their studies were influenced on a cultural plane in addition to a psychological one. According to the professors, in order for these longstanding stereotypes of various groups to fade, the media must more forcibly incorporate diversification into their representation of different individuals. to acquire. Others may be concerned about the declining image of the College because the bricks represent the long and rich history that newer colleges cannot always offer. These bricks also create a beautiful, romantic and traditional visual appearance to brighten any difficult day for students. Although this effect is a shame, that is not really a pressing issue, either. The real issue with this theft is the safety concerns that the missing bricks pose to students, employees and visitors alike. It is actually fairly easy to trip or fall into these holes, even while walking on a sunny day if someone is not paying enough attention. More dangerous at night or on days when it rains a lot, these holes actually fill up with rain and make it difficult to differentiate the deep puddles from actual bricks. By tripping or stepping into these spaces, innocent people can obviously trip and fall, but they also run the risk of twisting their ankles or tearing ligaments. This risk is increased for those with disabilities, such as for people who are blind or require the use of a wheelchair. Of course, there are some areas where the bricks are already a little uneven, and of course students often trip in those areas, but missing bricks are amplifying the issue and endangering all students, employees and visitors for the sake of a little rebellion. Students have to consider that their actions have consequences. Most of them only take one, which may not seem like a big deal, but if this trend becomes more popular, there could be hundreds or thousands of holes in the sidewalks by the end of each academic year. Email Alyssa Slovin at amslovin@email.wm.edu. about it. It’s important to take a step back and find the humor in what you do. Finding your flaws and addressing them is part of humility. At times, you do need someone else to call out the flaws for you. But right now, this isn’t harmless fun. Some members of each group are calling for the disestablishment of the other one. As the future Editor-in-Chief of the Botetourt Squat, I’ve had to learn a lot about the fine line between poking fun and bullying. The reason why so many people are upset by The Flat Hat’s opinions pieces is that they directly criticize the hobby and creative outlet of students on campus, calling them “unfunny” and “lame.” The most recent letterto-the-editor talking about certain unfunny individuals was clearly targeting one meme maker; I don’t know if there rules against targeting in The Flat Hat, but I know in the Botetourt Squat we are not allowed to make fun of individual students or else we can be accused of harassment. Right now, many on ‘Swampy Memes’ feel like they are being targeted by The Flat Hat. As a response, ‘Swampy Memes’ has seen a lot of posts directly criticizing the content and quality of The Flat Hat, which is targeting specific students on their hobby and creative outlet. Do you see the issue here? We are trying to out-shove each other in lockers, calling each other the losers. But we’re all at the College together; we’re all geeks here. I feel like an exasperated mom who just got off from a 10-hour shift only to come home to my two teenage sons trying to literally eat each other for something somebody said. Knock it off, you two. Now if you excuse me, I’m going to edit another picture of Gibby hitting Spencer with a stop sign. Email Hallie Feinman at hjfeinnam@email.wm.edu. But right now, this isn’t harmless fun. Some members of each group are calling for the disestablishment of the other one. Just as a warning, I reference suicide within this piece. Last weekend, I received an email informing me that I had been selected as part of a study to gather feedback on ways to improve health and wellness services at the College of William and Mary. “Thank Christ,” I thought, like an idiot. “They’re actually going to hire therapists.” I clicked on the link and started to fill out the survey. Instead of questions about mental health on campus, there were queries about the new McLeod Tyler Wellness Center. While suggesting that the College does not really care about the well-being of its students might be considered an extreme statement, that is exactly what I believe. The survey was a depressing reminder that, despite discourse over the College’s failures to address mental health struggles on campus, the administration is unlikely to change anything. Even though I’m a relatively recent transfer, it has become very clear to me that the College values aesthetics and brand above all other things. Look at how the College has been spending its money as of late. There is a new alumni center, alumni weekend and an anatomically correct griffin statue — all transparent efforts to woo donors into kicking back cash into For The Bold, because I guess $800 million still is not enough money for athletics. Make no mistake, these things help bolster the College’s beloved reputation as a Public Ivy, but they do not help students. It’s even more frustrating when the Board of Visitors simultaneously considers raising tuitions, presumably to spend that money on this nonsense or to send it to where last year’s money should have gone. The Wellness Center is maybe the best example of this mindset. This isn’t an attack on the people who work there. In my experience, they have been incredibly committed and helpful, especially when it comes to physical health needs. But when the College wants to improve health services, what does it do? Of course, they create a $1.5 million building with a fake waterfall and whatever a “compassion garden” is. Of course, they sink money into an essential oils pyramid scheme. These are all things that it can point at as evidence that it’s an elite university with the prettiest buildings and the trendiest alternative health classes; sure, these resources have helped people, but would it have maybe been possible to spend $1.4 million and then hire some therapists? I say all of this because of my genuine concern for the students at the College. It’s no secret that colleges are a pressure cooker of stress that often breed or feed into depression and other mental health issues. The College is no different (I direct you to “William & Mary Bad Vibes,” a Facebook group in which students vent about their stresses, frustrations and problems as if it’s a crowd-sourced therapy session). If the College does nothing about the current situation, one in which any given student has to wait five weeks for an opening counseling session, there will be consequences. Someday — I hope to God not today, tomorrow or five years from now — but someday, some poor student is going to give up on therapy. They won’t be willing to wait months for help — if it’s even offered — and they won’t be able to afford private care. They will tell nobody about this, because they’ll be scared that a care report will result in a forced medical withdrawal, throwing their academic career off course. And then they’re going to become a victim of suicide. When this happens, do not listen to whatever grieving mass email the administration sends out. That blood will be on their hands. Email Aidan O’Halloran at baohalloran@email.wm.edu. assigned to Residence Life staff. The Center for Student Diversity also provides follow-up for academic, social and transition needs for underserved students from diverse backgrounds. Reporters may always indicate that they would like to remain confidential and not be identified as the source of the report. Staff will follow up with reporters to indicate receipt of the report and to confirm they will connect with the student if necessary. Typical response time is between 24-72 hours, depending upon the nature and severity of the concern. The care report system allows us to provide intervention and support to students with a wide variety of needs. We appreciate that the College’s community continues to report concerns so that we can help guide students toward appropriate resources. There are additional ways to support students in need including sexual misconduct/Title IX incident reporting. Please reach out to the Dean of Students Office for additional information. Rachel McDonald is the Director of Care Support Services in the William & Mary Dean of Students Office. Email Rachel at rlmcdonald@wm.edu. If you have a question you’d like to see answered, please email it to fhopinions@gmail.com. We appreciate that the College’s community continues to report concerns so that we can help guide students toward appropriate resources. sick of the same options week after week. The only downside is that the Tribe Truck is a little too popular to always be a practical dining option. If you want a special, food truck lunch, you have to carve out enough time to stand in its long line, which often extends all the way to the Daily Grind. However, if the weather is nice, you’re with your friends or even if you’re standing there alone listening to your music or reading a book, it’s worth the wait. While the line may be long, the Tribe Truck is usually quick to make your order, and once you get your food, there are plenty of spots nearby, on the Terrace or inside Lodge One, to enjoy the meal you valiantly stood in line for. While the Tribe Truck is a tasty alternative use for your meal swipes, it makes other options for meals seem increasingly disappointing. Why can’t it all be of that superior quality? The Tribe Truck is a step in the right direction, but it too will one day become less of a thrill. The long line we’ve all come to expect outside of Sadler will most likely become shorter and shorter, as the newness of the Tribe Truck wears off. However, regardless of whether its popularity wavers, the Tribe Truck will remain a reminder of what students would like to see more of in their dining options. Rather than letting the success of the Tribe Truck fade away, let’s keep this momentum going and decide what is the next dining option to be revamped. Email Caroline Wall at cewall01@email.wm.edu. Earth Day — Monday, April 22 — is a perfect opportunity for us as students at the College of William and Mary to rethink our treatment of the environment. In March, Rep. Alexandria OcasioCortez, well known for her Green New Deal and urgent rhetoric about the climate, openly admitted that she will often “get 10 plastic bags at the grocery store and then have to toss [them] out ... because the recycling program in the area is tough.” Patrick Moore, co-founder of Greenpeace, responded by calling this behavior hypocritical; OcasioCortez defended herself by saying that she is “living in the world as it is”— for example, she also flies, uses air conditioning and, oh yeah, listed over a thousand Uber transactions during her congressional campaign despite the subway station .03 miles away from her office. News flash: the climate is important. Instead of sitting around ruminating about how the world is going to end in 12 years if we don’t address climate change, wouldn’t it be cool if our politicians actually did something about it in their personal lives? I’m not talking about ambitious legislation; climate action starts with the individual. One politician exemplifying a truly sustainable lifestyle is way more powerful than just talk. On an even smaller level, one person taking individual steps toward an environmentally-conscious life has significant effects. hundreds of companies are responding to consumer demands for this environmentally-conscious option. MAC Cosmetics allows customers to exchange their empty lipstick tubes for new ones, incentivizing recycling. The other day I saw an ad on Snapchat for shoes made out of recycled plastic. Companies like WINIT have created things like silicone airtight bags and unbleached paper tea bags. Lush makes shampoo and conditioner bars to cut down on single-use plastics. You can bring used Nespresso capsules to convenient recycling collection points. Reusable straws are the norm now. Seventh Generation is a company that sells eco-friendly cleaning products from plant-based laundry detergent to recycled toilet paper. Pilot makes pens out of recycled water bottles. There are literally shower heads that have been created for the sole purpose of saving water and energy. I could go on. There are people and companies that are actively responding to the seriousness of the climate movement. As college students who care deeply about the environment, we should be coming up with bright ideas like these. At the very least, we need to resolve as individuals to take steps toward a cleaner, better Earth — whether by being conscientious about the waste we produce or by replacing everything we own with the more sustainable option, which, as I think I’ve demonstrated, definitely does exist. If we aren’t doing all we can to play our part in caring for the environment, we don’t really have a right to anxiety or judgmental outrage. Email Chloe Folmar at csfolmar@email.wm.edu. There are people and companies that are actively responding to the seriousness of the climate movement. As college students who care deeply about the environment, we should be coming up with bright ideas like these. After close loss in its last game, the Tribe seized its opportunity to take a win against the Blue Hens. Due to the efforts of freshman attacker Belle Martire, the College was able to persevere and win the game in an overtime period. score to 11-9 with just two minutes left in the half. Freshman defender Starr Howard was given a yellow card, and the referees allowed D’Antonio a free position shot, which she subsequently made, bringing the score to 11-10. With 23 second left in the game, the Blue Hens called a timeout, hoping to equalize the score and go into overtime, a successful gambit due to a goal by Blue Hens midfielder Mia DeRuggiero with 13 second left on the clock. Ending the second half with an 11-11 tie, the College and the Blue Hens were forced to go into overtime to determine the victor of the match. After a fiercely contested overtime round, during which the Blue Hens had a failed free position attempt, a goal by Martire with 22 seconds left in overtime saved the game, 12-11. “It was a dog fight from top to bottom,” head coach Hillary Fratzke said. “I’m really proud of the girls. We talked about it all week — finding a better way. Honestly, that was the only thing they could do out there. They scored that last goal man-down after we got our fourth nonreleasable yellow card. It was pure gut.” The Tribe travelled to Towson, Md. April 14 and fell to the Tigers 12-22. Read more about this game at flathatnews.com. Gabby Runge finishing 2nd and 6th respectively with times of 55.52 and 57.99, both personal bests. While the sprinters have not been as active this season, they provided some much-needed support for the College this weekend. Overall, the Tribe recorded 17 total ECAC qualifiers in addition to the 23 lifetime-best marks on the women’s side. The College leads the CAA in numerous events including the men’s shot put heading into the tail end of the season, with the CAA championships just three short weeks away. Both men’s and women’s teams have three meets remaining and will travel to Virginia, Pennsylvania, and North Carolina within the end of the month. Both teams will then travel to Elon University along with the rest of the conference for the conference championships starting May 3. The final meet of the season for most of the Tribe will be the ECAC championships, May 11-12 hosted by Princeton University. Both teams will be back in action at the Duke Invitational in Durham, N.C. next weekend, action kicks off on Friday. In head coach Jimmye Laycock’s last season, William and Mary improved on its 0-8 record in the Colonial Athletic Association from 2017. The Tribe managed to win three games in conference in 2018, spurring the College to a 4-6 record. Shortly after the conclusion of the season, the Tribe announced that it was hiring former Virginia head football coach Mike London for the same position at the College. London was previously a defensive line coach at the College under Laycock in the early 1990s. He won a national championship as the head coach of Richmond in 2008, before accepting the head coaching job at Virginia. For the last two years, London was the head coach at Howard. At the College, he is tasked with reinvigorating a struggling Tribe program that mustered only 11 wins in Laycock’s last three seasons. The Tribe has not been to the Football Championship Subdivision playoffs since 2015. This year for the spring game, the team split into first and second-string offenses and defenses. The first-string offense, the green team, was led by junior quarterback Shon Mitchell and senior quarterback Brandon Battle. The second-string offense, the gold team, was led by junior quarterbacks Ted Hefter and Dean Rotger, along with redshirt freshman quarterback Kevin Jarrell. On the first drive of the game, Hefter led the gold team on a steady drive downfield before the offense stalled out in the red zone. Senior kicker Kris Hooper put the first points on the board in the game with a 39yard field goal to make the score 3-0. Battle led the green team onto the field for the first time and promptly threw an interception with just over half of the first quarter left to play. On the green team’s next possession, Mitchell got the nod, but the drive ended with another interception. Hefter ended up getting a chance with the first-string offense and led the green team right down the field. Senior running back Albert Funderburke and sophomore running back Owen Wright were featured prominently on the drive and Wright ultimately cashed in with a nine-yard touchdown run. “Our running game has improved a lot, particularly with the guys up front,” London said. “Your running game goes as your offensive line goes.” Wright took the pitch from Hefter and got to the edge before lunging towards the pylon for the first touchdown of the game. That gave the green team a 7-3 edge with just over three minutes to play before halftime. Neither team was able to score for the rest of the second quarter. In the second half, there was a running clock and the third quarter flew by, but the green team was able to stretch its lead to two possessions on the last play of the quarter. Wright scored his second touchdown of the game on a two-yard scamper to push the green team’s advantage to 14-3. The game was cut short with 5:48 left on the clock due to an injury sustained by junior offensive lineman Dan Evers. According to London, it was a high-ankle injury. The Tribe has faced an uncertain quarterback situation over the past two seasons, with at least three players getting significant playing time in each of those seasons. It is still unclear who will be under center for the Tribe’s season opener, but steady play at that position will be key to the Tribe’s success in 2019. “We’re going to put the best player out there,” London said. “We’re going to be definitive about it. … There were some good things that happened out there tonight, but there are some obvious things that we have to take care of.” The College will open its season at home against Lafayette Aug. 31. Teams Green and Gold battled it out on the field before game was cut short. The College’s freshman have taken a large role on the squad this year, both on offense and defense. Freshman defender Starr Howard and freshman midfielder Lauren Russell have also made serious contributions to the team this season. building players from the ground up. No detail is too minute to matter to these athletes, and they’ve worked hard to improve themselves and each other. They’ve also made it abundantly clear that they will set the tone for the season themselves. The result is a complex ecosystem, in which each player’s strengths and weaknesses are utilized. The upperclassmen depend on the freshman for their energy, drive and focus. “We’ve had a lot of change this year, … a lot of freshmen,” Rall said. “They have just brought a completely different mindset to the whole process, and I think that has really helped the upperclassmen.” The rookies look to the veterans as examples of perseverance through less than spectacular seasons and dedication to something bigger than themselves. “We have to make the most of every opportunity and know that the work that we put in will pay off,” Martire said. “Whatever you’re doing … give it all you’ve got.” Social class distinctions aside, each member of the team recognizes the importance of presenting a JAMIE HOLT/ THE FLAT HAT united front on and off the field. When it comes to determining the future of the team, the emphasis on teamwork doesn’t change. “Nothing compares to starting the season,” Martire said. “… We all knew that we had to be there for each other on a level that personally I had never experienced before. So, I think just kind of knowing that we’re all going through this experience together, the stress and the excitement, and just all the kind of emotions involved with starting the season … that was kind of the defining moment.” Rall and Martire, record breakers in their own rights, are grounded by their teammates. They have personal goals, of course, but those are mentioned only in passing. Far less fleeting are their plans for the future of the team. They hope to take the CAA by storm, and with a victory over Delaware marking their first conference victory in nearly three years, that goal no longer seems unreachable. The closer it gets, though, the more focus will be required of them. The team faces the danger of being lulled into a false sense of security by early successes. They still face a punishing conference schedule, packed with teams like the undefeated James Madison, as well as Hofstra and Towson who are both 2-1 in CAA play. However, Rall and Martire are determined not to underestimate any opponent. They set goals of out-working every other team in the conference, and they are well on their way to meeting that goal. Despite the obstacles and the pressure, both Martire and Rall look towards the future with excitement rather than trepidation, neither one feeling the pressure of any predictions for the team except their own. They’ve each shattered enough records to know when a limit can be exceeded, and that’s exactly what they plan to do. 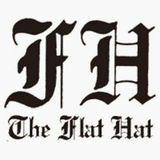 The Flat Hat is the College of William and Mary's weekly student newspaper.